I'm sure many of us with cats have help like this. I know I do. I can't figure out why cats think you can see the computer screen when they are sitting in front of it. This is our Persian, Sam! 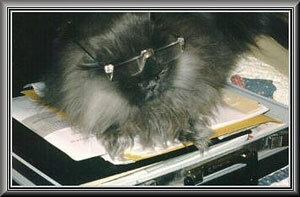 Sam is the intelligent, "nerdy" cat in the Spillers' family, as you can see... he's more the "executive" type! Sam loves to be in the middle of whatever activity is taking place, and here he is helping "Daddy," who is an accountant and income tax consultant who owns his own business and sometimes brings work home at night. It was "too cute" to see Sam when Jim stuck his reading glasses on him for this photo. By the way, when Sam was a kitten, he had an eye problem where his veterinarian literally did a procedure that required Sam to wear contacts for a week! I probably had the only cat in our little town with contacts! But these glasses are just a "gag," I can assure you. He is really a sweet cat, probably one of the sweetest we've ever had, and he purrs so loud!! He is almost 10 years old now. Because Sam has a flat face, he also has a tendency to slightly DROOL! Lovely Kitty . Some are also "Helpful" at the TV set. Love the glasses & the story of the contacts.